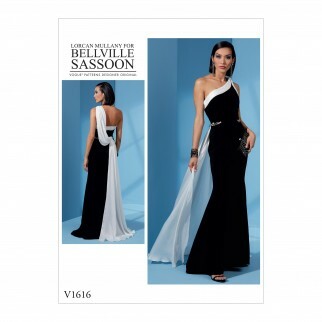 One shoulder dress is close fitting through bust and fully lined with interfaced partial underlining, boning with self bias covering, invisible side zipper, princess seams, neckline and armhole stays, drape detail, purchased beaded trim at waist, lower edge extending into train and very narrow hems throughout. Fabric suggestions include: Crepe, Velvet, Crepe Back Satin. Contrast: Chiffon, Charmeuse. Lining: China Silk, Bemberg Rayon. Interfacing: Medium Weight Fusible.